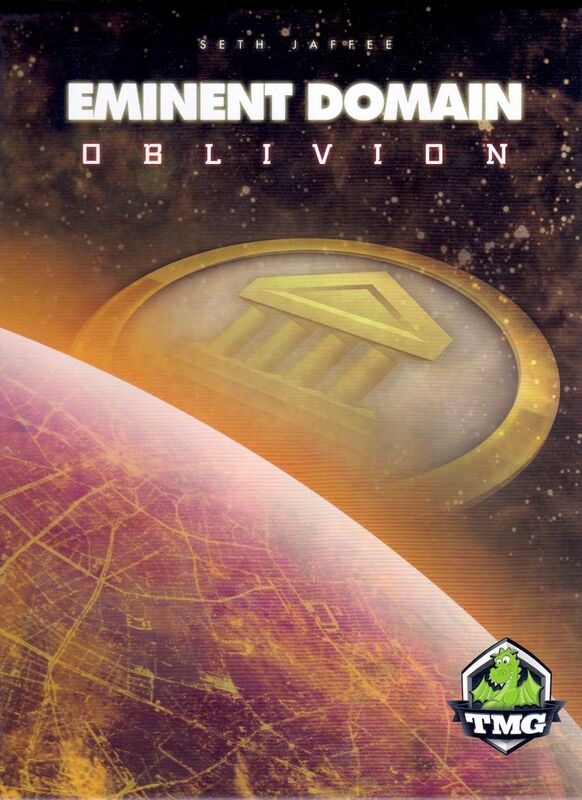 Eminent Domain: Oblivion is an expansion for Eminent Domain by Seth Jaffee, published by Tasty Minstrel Games. It is for 2-5 players. This expansion adds a new Politics Role and Global Agendas that affect all players. It also adds new Technology cards, new Planets as well as a promo pack for combining this expansion with previous expansions. For more information on the base game and how to play it, please check out the link below. Setting up this expansion with the base game is pretty much the same. However the new Central Card Display board should be used in place of the original one. Once normal setup has been finished, each player is given a Political Influence card. The new Planet cards are shuffled into the Planet deck and all the new Technology cards are sorted by type and placed into 4 face up piles near the original Technology cards. The number of Role cards to be used are based on the number or players and determined by a chart inside the rulebook. Each player creates their starting deck and gets 2 Politics cards instead of 1 in their deck. The Agenda cards are shuffled and dealt out face up into each of the Upcoming Agenda slots on the top of the board. Players shuffle their starting decks and draw 5 cards each. Play now begins. Many of the rules for playing the game haven’t changed. However there are a few new concepts introduced in this expansion that changes things just a bit. For instance, in the Replenish phase, any empty Replenishing slots in a player’s Empire are replenished at the start of the player’s turn. If a particular card contains more than one Replenishing Slot then each empty slot will refresh even if the other slots are full. In the Action phase, players are allowed to take one action from a card in their hand, from their Political Influence tile or from any of their face up Planets or Technology cards in their Empire. Of course this phase is still completely optional. Cards played during the Action phase are set aside and will have no effect during the Role phase. Actions on Planets and Technology cards are limited to once per Action. The Role phase is conducted the same as with the base game. Cards played to boost or follow a role are set aside and have no effect during any subsequent Role phases. Role symbols on Planets and Technology cards may be used only once per Role. The Cleanup phase also works the same, except with one minor adjustment. At the beginning of this phase and before the player reconciles their hand, all cards that were set aside during the player’s Action and Role phases are placed into the Discard pile. Any players that followed during the player’s Role phase will also place any cards set aside into their Discard pile. The game continues until one of the end game triggers occurs. This can be either a number of influence tokens or role stacks have been depleted. When this occurs, the current round is completed like normal and then one additional full round is played. Just like with the base game, players will then add up their influence from the various different sources in their Empire. The player with the most points is the winner. As I noted earlier, there are lots of new components and mechanics included in this expansion. I’d like to take a few moments to discuss some of the new things that this expansion introduces. I’ll start with the Clout tokens. These are double sided tokens that have the Politics symbol on one side and one of the various Role symbols on the other. They are drawn when following a Politics role, using the action on the Political Influence tile or through some other action from a Planet or Technology card. These are kept face down in the player’s Empire and may be used to boost or follow a relevant Role. Once used they are discarded into a pile beside the bag. Next there’s the Political Influence tile. Each player will start with one of these that can be upgraded later into an Improved Political Influence tile. The tile allows a player to draw a Clout token or trade a resource for another, different resource instead of playing a card from their hand. Once upgraded, the improved tile provides a permanent Politics symbol and improves on both of the previously mentioned actions. Instead of just 1 Clout token, the player can now draw 2 and then discard 1 from their Empire. They can also trade more resources than before. Instead of just 1, they can now trade up to 2 for 2 different resources. The tile also gives each of the player’s planets an Annex cost of 7 Politics, allowing the player to Annex any planet in the game. On top of these new tiles and tokens, the game also adds lot of new terminology, planets and prestige planets. I won’t go into all the details, just be aware that there will be some new mechanics to understand. For more information on these, check out the rulebook. Speaking of new mechanics, the biggest change that this expansion brings to the table are the Agendas and how they work with the Politics role. Agendas start off at the top of the board in the Upcoming Agendas space. Each one has a cost ranging from the most expensive on the left and the least expensive on the right. The cost to activate these are the number of Politics icons that must be paid. These Agendas affect all players equally but also provide a bonus to the player activating them. This brings me to the Politics role. Like any of the other roles, the Politics role follows a specific order. First the player declares a proposal this can be either to activate an Agenda, dismiss an Agenda or Annexing a Planet. Activating an Agenda if successful is done by paying the cost in Politics. It’s then moved to the leftmost Active slot at the bottom of the board, moving any other Agendas to the right 1 space. If an Agenda moves off the board, it’s returned to the bottom of the Agenda deck. The Active Agendas will now act like a permanent Technology in all of the player’s Empires. Dismissing an Agenda is also paid for with Politics, if successful. However when this is chosen, the chosen Agenda card is removed and then moved to the bottom of the Agenda deck. When removed this way, the effects of the Agenda are no longer active. Annexing a Planet, if successful, is done by flipping the Planet over and paying the Annex cost in Politics. Once the proposal step is completed, the players moves on to boosting the role by using Politics symbols from cards in their hand and permanent Politics symbols already in play. Next the player solicits support, this means that the other players have the option to follow the player’s chosen role by playing Politics cards from their hand or using Politics symbols in their Empire. Of course the players have the options of dissenting as well, drawing a card from their deck. Next the Politics symbols that were played by all players are spent. As long as the chosen proposal has enough Politics symbols, then that proposal must be done. The player must spend Clout tokens if necessary. However, if there are not enough for the declared proposal then the player is allowed to do any 1 of the 3 of their choice, as long as they can afford it. If there are any leftover Politics symbols, then the player may do a different proposal of their choice by paying for it. Finally, all of the player’s opponents are now able to draw a Clout token for each Politics symbol that they contributed to the proposal. Any cards they played are discarded, as are any Clout tokens used. Once the Politics role has been completed, if there’s an Agenda in the rightmost Upcoming slot, it is returned to the bottom of the deck. The remaining Upcoming Agendas are moved as far as they can go to the right. The leftmost slot is then filled by drawing a card from the top of the deck to fill it. This expansion has a lot of great looking pieces. If you’re already familiar with the base game, then you already know what I’m talking about. The artwork is great on each piece and carrys over the same styles and theme from previous expansions and the base game. The expansion has a new board that represents the changes to the cards and includes the new agenda spaces. There are 2 new starting planet tiles and a handful of new political influence tiles. These are all thick cardboard and are quite sturdy. The same can be said of the clout tokens. These come on a large punchboard and have the Politics symbol on one side and one of the other roles on the other. These all fit nicely in the large cloth bag that was included. I have to say that I like that the bag is so large that you can fit your hand into it quite easily. It’s large enough that even those with really big hands will have no troubles. Also included are the new smaller sized Agenda cards. These are about the size of Euro cards. These don’t have a lot as far as artwork goes, mostly it’s just symbols and text on these. There are plenty of new planet and technology cards. These are the real beauties of this set. The artwork is really great on these and the new technologies really fit in well with the theme of this expansion. There is also a good sized stack of new Politics role cards that upgrade the old ones that didn’t do much. 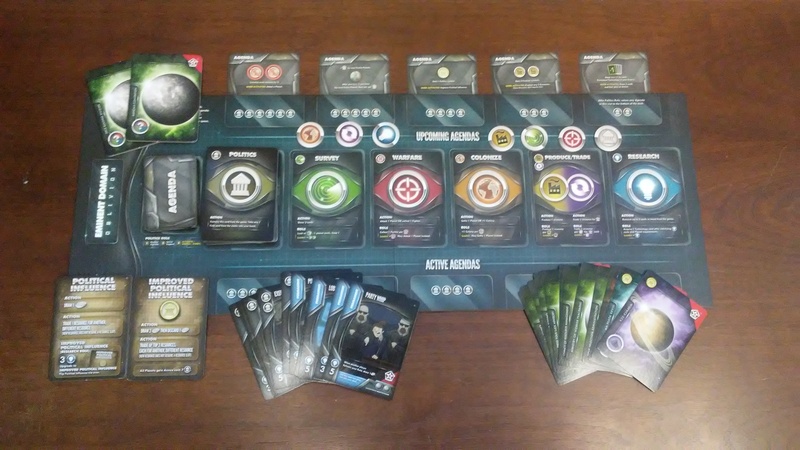 If that weren’t enough, the expansion also includes a promo pack or cards and tiles for combining this expansion with other expansions in the Eminent Domain universe. The rulebook explains how to use these with each one. Overall, I’m very pleased with the look and feel of the expansion. The quality is out of this world. The rulebook for this expansion is very similar to those from previous ones. It’s full color and has lots of great looking pictures and examples throughout. Each of the new features, items and mechanics are all covered in great detail. Everything from setup to playing the game is covered. There are several pages devoted to each of the Technology cards with pictures and explanations of each. The same is done with the agenda cards. Even the agenda and technology cards from the promo park are shown in pictures with explanations. The book itself is easy to read and understand. Players familiar with the game should have no troubles understanding any of the concepts presented in this rulebook. Overall the rulebook is much like the components, high quality. I have to say, I like Eminent Domain quite a lot. In fact, it’s one of my favorite deck building style games. This expansion adds yet another layer of depth to an already great game. The Agendas and Political role cards are a lot of fun. I like having these global effects that can be added to the board to help you out but that can be removed when they start becoming more help for your opponents instead of you. I like that the Politics role actually has more emphasis put on it in this expansion. Previously I had little use for it, but the new mechanics for this role have made it more interesting to take and use now. The new technology cards really emphasize this too. With this new expansion, the game has been opened up to even more ways to win. Many times I found that warfare was the fast track to victory, however that’s not the case anymore. While a good fleet of ships is useful, there’s still a lot that the new Political role can do too. Needless to say, there are new strategies that will be found and lots of great fun to be had with this expansion. Fans of the original Eminent Domain and it’s expansions will most definitely want to add this one to their collection. I highly recommend it. It’s a great addition to an already amazing game. You can’t go wrong with this one. Eminent Domain: Oblivion is an expansion for Eminent Domain that really adds lots of new layers and choices for players of the original game. This expansion adds about 15 more minutes to the base game, making gameplay right at about an hour. The artwork and quality of the components are absolutely great just like previous expansions and the base game. The expansion adds a lot more depth to an already great game. I especially like the new Politics roles and the Agenda cards. I feel that these new mechanics and ideas round out the game making it even better than it was before. There are new paths to victory and this expansion really capitalizes on the new Politics role especially through the Technology cards. Fans of the original game and it’s expansion will most definitely want to pick up a copy of this to add to their collection. I highly recommend it. For me, it’s a must have. If you like space themed deck building games, then you will love this game and this new expansion. It’s Far Out! This entry was posted in Reviews and tagged board, board games, card, card games, domain, eminent, eminent domain, games, jaffee, minstrel, oblivion, seth, seth jaffee, tasty, tasty minstrel, tasty minstrel games. Bookmark the permalink.